Aw! 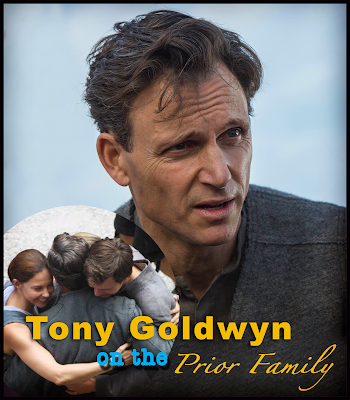 Tony Goldwyn (Andrew Prior, Father to Tris & Caleb in Divergent) talks about being part of the Prior family, along with Shailene Woodley (Tris), Ansel Elgort (Caleb), & Ashley Judd (Mother, Natalie). Those that followed along during filming may have seen the cute messages they tweeted, about loving their onscreen family. From Hollywood Crush: You're going to have to wait for March 21, 2014, to see "Divergent" on the big screen, but if you caught the trailer at San Diego Comic-Con, you've already seen more than Tony Goldwyn—who was actually in the movie—has. "Divergent" follows teenager Tris Prior in dystopian Chicago as she discovers that she's a dangerous/ mix of several of her society's personality-based factions and subsequently sparks a revolution. When Hollywood Crush caught up with Tony earlier this week, he revealed that Tris' big leap into the Dauntless headquarters is one of the scenes he's most excited about seeing in finished form. That, of course, was one of the trailer's highlights (yeah, just gonna rub it in that we've seen it). But Tony, who plays Andrew Prior, the father of our heroine, is also looking forward to seeing a couple of scenes he was actually in. Of course, as you'd expect, Tony has nothing but nice things to say about the film. "The book is so wonderful, but being a movie, Neil brought incredible dimension to the different worlds and the factions. It's really rich and complicated. We have such a great cast... It was a really great experience." The "Scandal" actor read and really enjoyed "Divergent," but (SPOILER ALERT IF YOU HAVEN'T READ THE FIRST BOOK) he didn't go any further in the series considering his character meets an untimely end at the conclusion of the first book. While the magic of movies leaves the door slightly open for him to potentially return for the sequels (flashbacks! apparitions! the possibilities aren't endless, but there are some options! ), author Veronica Roth put the kibosh on any resurrection. "I doubt it," Tony said of a second appearance. "Veronica Roth said, flatteringly, one of her biggest regrets is that she didn't write Andrew into the other books, that she killed Andrew off, so I don't think there's much hope for a resurrection of the ghost of Andrew. But we'll see." See! There's always hope for more.